The temperatures have hit triple digits and it's far too hot to exercise outside (except in the swimming pool). Yesterday morning I was tempted to sit and watch two World Cup Games - USA v. Slovenia and England v. Algeria but instead I hit the record button and popped in the Biggest Loser Workout CD. Listening to Jillian scream at people does nothing to encourage me, but Bob Harper has a whole different approach and I like the pace of the workouts. I have started with the Level 1 Circuit Workout which is recommended for 1-2 weeks (4-5 times a week). Bob is joined by a few of the Biggest Loser winners including Ali who was the first female winner, and lost 112 pounds - she looks great. 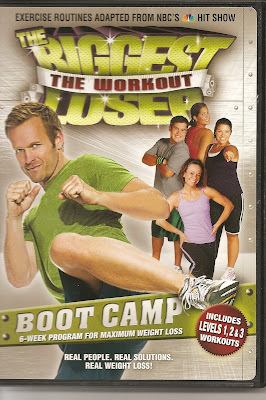 There are many different choices on this CD including a workout that you can customize. One thing I have noticed with working out so much (I'm trying to exercise for at least an hour a day) is that my posture has improved tremendously. Try out different exercise CDs from the library or Netflix and find one that works for you. And now I'm going to make some green tea and watch the USA World Cup game. You know I have several of these Biggest Loser tapes and forgot about them. Thanks for the reminder and I hope you have a good week.